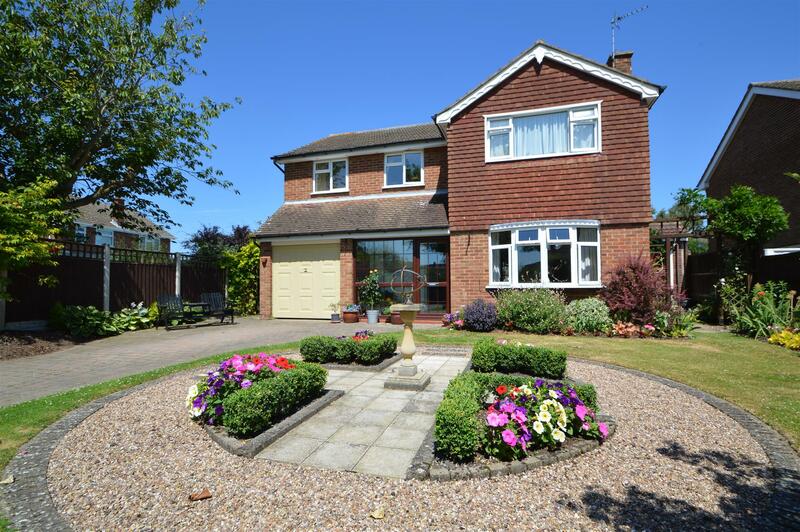 Benjamins are pleased to bring to market this Premium 4 Bedroom Detached Family Home in a Secluded End Of Cul De Sac Location on Belvedere Close, Keyworth. The property briefly comprises: Entrance porch, hallway, living room, dining room, kitchen, utility room, down stairs WC, four bedrooms, family bathroom. Gardens to front and rear, integral garage, driveway for several vehicles. Welcoming hallway with tiled flooring, understairs cupboard, radiator with doors to downstairs wc, kitchen & living room, stairs up to first floor landing. UPVC double glazed window to the front aspect, gas fireplace with surround, ceiling light, carpet & door into dining room. With a range of floor and wall mounted wooden kitchen units with work surfaces over, tiled splash backs, stainless steel sink one & a half bowl with drainer, mixer taps, integrated oven, gas hob, plumbing for dishwasher, space for fridge freezer, ceiling spot lights & tiled flooring continued from the hallway, breakfast bar seating area & utility storage cupboard. UPVC double glazed window overlooking the rear garden. Door to the utility area. Plumbing for washing machine & space for tumble drier. Wall mounted storage cupboards & tiled flooring. Door into the side of the property with access to rear garden and the front of the house. UPVC double glazed window & door to the rear aspect, radiator, carpet, ceiling light fitting. Door into kitchen & living room. Low level WC with wash hand basin, heated towel rail & tiled flooring, UPVC frosted window to the front aspect. Spacious landing area with UPVC double glazed window overlooking the front aspect, doors to four bedrooms & family bathroom. Access to the loft via hatch. 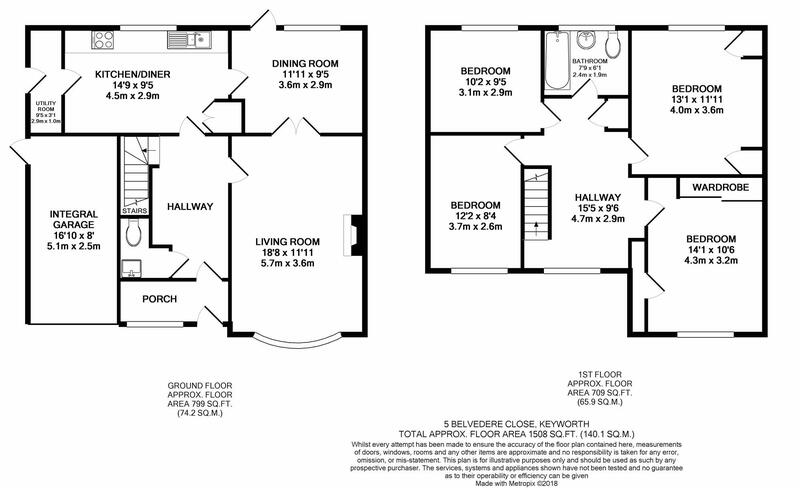 A three piece suite comprising of wash hand basin, low level WC and panelled bath fully tiled with electric shower over and glass shower screen, half tiled walls, opaque UPVC double glazed window to rear aspect, radiator. UPVC double glazed window to the front aspect, built in wardrobes & storage cupboard, ceiling light fitting, radiator, carpet. UPVC double glazed window to the rear aspect, built in overhead wardrobes & ceiling pendant fitting, radiator, carpet. UPVC double glazed window to the front aspect, ceiling pendant fitting, radiator, carpet. UPVC double glazed window to the rear aspect, ceiling light fitting, radiator, carpet. The rear garden has a selection of mature shrubs and bushes and fenced borders with patio and seating areas around the garden. Access to a storage area to the side of the property with power and gated access to the front of the property. The front garden has a mixture of lawn and decorative stone with flowers & shrubs and driveway with parking for several cars. The garage is accessible from the front with up and over door with light & power. UPVC door to the side of the property.